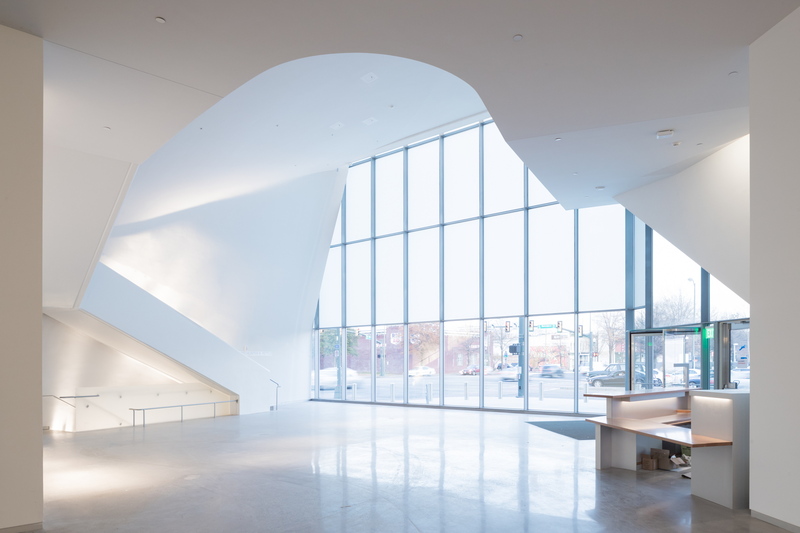 Steven Holl’s entire project for the ICA, the Institute for Contemporary Art in Richmond, Virginia, revolves around the concept of opening: everything seems to invite visitors to metaphorically enter the world of art through a spectacular portal with diverging volumes alluding to different disciplines. The Institute for Contemporary Art opened on April 21 2018 with an important exhibition entitled “Declaration”, consisting of 60 interdisciplinary installations by 33 emerging and well-known artists. The new Markel Center at the ICA is a 3800 square metre building on 3 levels with a 240 seat auditorium, a cafeteria, classrooms, art storage facilities, 4 exhibition galleries - one on the ground floor, two on the first floor and one on the second floor – a workshop, a patio and a coffee shop. 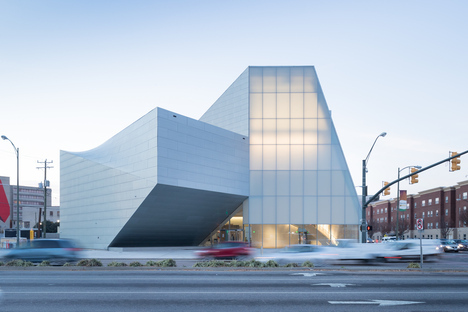 Situated at the historic intersection of Belvidere and Broad in Richmond, the institute acts as a gateway to the city; unlike medieval city gates, it does not define or separate what is inside from what is outside the city, but connects the city with its emerging new cultural district. 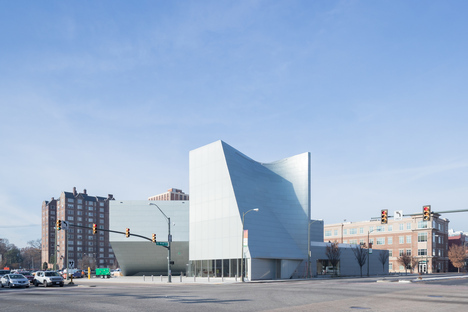 This is where Virginia Commonwealth University is located, a true cultural institution within the Downtown Arts District with its own galleries, art shops and studios. Steven Holl’s building is located at a busy intersection where the cultural district meets the city centre. The American architect has built an urban landmark of driving force, in which translucent opaque glass changes its appearance by day and by night and the volumes seem to twist upon themselves to simulate the energy produced by art inside the building. The museum is an attraction not only for art historians but also and above all for young artists, students and art lovers among the general public, defining art as a cultural discipline on a number of different levels. The polished concrete structure of the floors and walls is covered with a zinco-titanium and translucent opaque glass skin which is equally clean and regular. The perfection of the whole building’s surfaces makes the composition of diverging volumes that come together at the entrance appear even bolder. 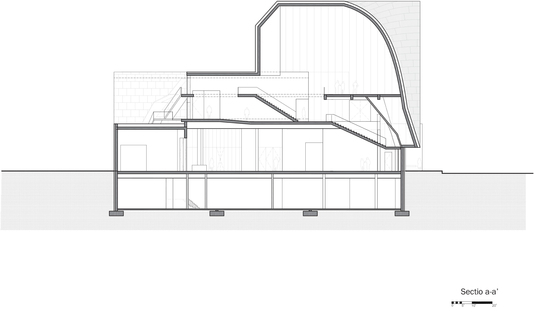 Right where the two main roads come together, Steven Holl has designed the forum block and slipped the block containing the auditorium over it. While the other four volumes radiate out from this block horizontally, the forum rises up to tower over the others. The architect offers a symbolic explanation of this system: the vertical component represents the present, the artistic moment in which we find ourselves today, while the diverging horizontal components represent possible forks in the way, different potential paths to the future. Holl wanted to create a building that would look different from different points of view, so that drivers approaching along Belvidere or Broad in their cars would see it change as they move. 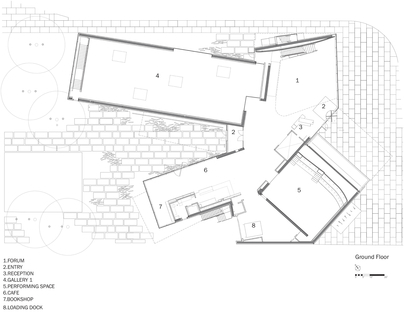 This apparent flexibility becomes real in the interior, organised into four galleries, each with a different character. 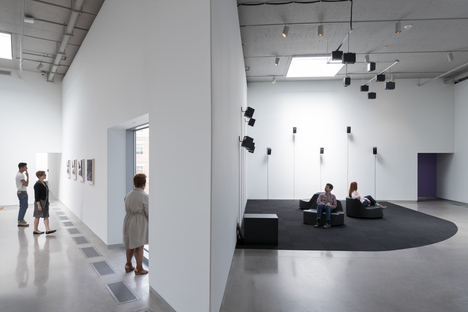 Their structure as independent volumes flowing together into the forum permits organisation of little separate exhibitions or one big uninterrupted show. 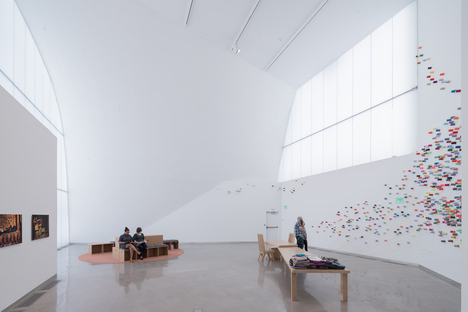 Each gallery may be closed off for installation without affecting the accessibility of the other galleries. The garden at the back of the building is connected with the cafeteria and one of the galleries, indirectly through glass walls and directly to permit organisation of events open to the public. 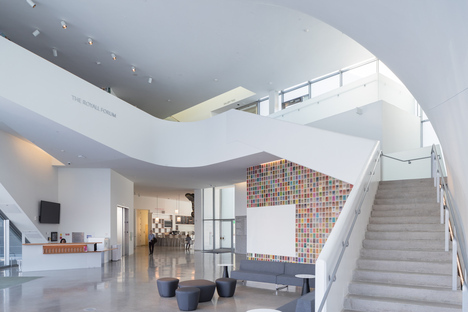 The spaces on the upper levels are projected toward this “locus amoenus” to the east, joining the Institute for Contemporary Arts with Virginia Commonwealth University. The project also has a strong focus on reduction of environmental impact: the zinc-titanium outer cladding is made up of 40% recycled material and is in turn 100% recyclable; 43 geothermal wells supply energy to the underfloor climate control system; green roofs absorb some of the rainwater and insulate the building; the garden has been planted with native local species, and the outdoor pavement is Pennsylvanian blue stone.